The infrared camera allows equipped with thermic and 2-dimensioned resolution simple and contact-free measurements of two- dimensional temperature distributions. Thus the infrared camera is especially applicable for industrial long-term operations. 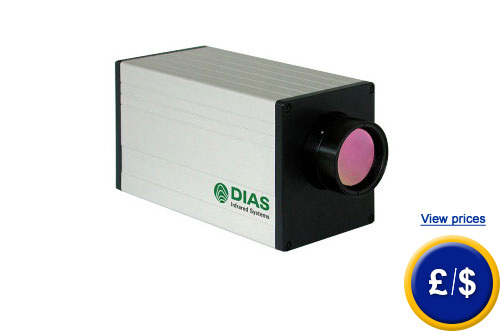 Measurements with this infrared camera can be performed at a spectral range of 8 µm to 14 µm, which is adequate for general measurements and monitoring. An achievement of best possible measuring values is ensured due to different objectives that are included in the delivery of the infrared camera. Due to a helpful and quick real-time data transfer by means of Ethernet to a computer, the infrared camera operates at a measuring frequency of 50 images per second. For a static infrared camera that is set on long-term operation, it is important, that it is also equipped with a stand-alone- operation and thus even functions without any linking to a computer. The infrared camera pyroview 380 L compact provides as additional equipment an alarming and threshold monitoring function as well as triggered measurements. The products are accommodated in an aluminium compact enclosure. The delivery even contains the online-software PYROSOFT, which allows amongst other things remote controlling and monitoring the infrared camera. Above all visualisation, editing and archiving of the measuring data is performable. If there are any questions about the infrared camera Pyroview 380 L compact or any other infrared camera, see the technical data below or contact us: UK customers +44(0) 23 809 870 30 / US customers +1-410-387-7703. Our technicians and engineers will be happy to advise you on this infrared thermometer with a digital camera or any other product on the field of regulation and control, measuring instruments and scales or balances.